The Camden (Maine) Village Soup is reporting that the Camden National Bank has foreclosed on properties associated with the Maine Photographic Workshops, Rockport College, and several residences and boats owned by Workshops Director David Lyman. According to the bank, which foreclosed on October 13th, it is owed more than $3.9 million. We're sure the many thousands of photographers of all levels who have fond memories of learning experiences at the Workshops over many years will be saddened to hear of its present troubles. We send best wishes to all who are affected and hope for the best outcome for all. 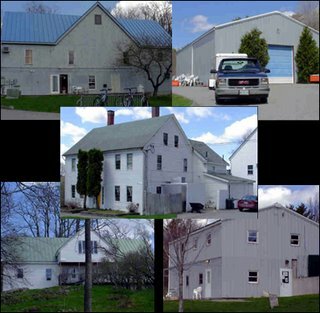 David Lyman's property at 70 Camden St., which consists of five buildings, including the Homestead, Haas Center and Film Barn, is valued by the town of Rockport at $1,983,700, including $1,306,200 for the buildings and $677,300 for the land, according to the Camden Village Soup. UPDATE: Read the 11/14/06 Portland Press Herald article "Famous school of photography in fiscal crisis" on MaineToday.com. that offered the workshops for sale not a week ago?? Indeed, although I'm unsure of the timeline. I've heard from a few people about this situation who I presume are insiders to some degree (including the tipster who led me to this article--I don't normally read the Camden Village Soup myself), and as you can imagine the situation is a good deal more complex than surface reports probably indicate. But I'm not going to report anything on TOP that hasn't already been posted on the Workshops' website or reported in the press. I just moved from Maine a few months back. Towns don't get much more quaint then Camden. Shame to see such a fine school/workshop go under. I am glad I hesitated in paying the workshop fee for next summer. The 15% they were advertising was tempting, but with the TOP post last week about it being for sale with a potential buyer by Nov. 1st I became a little skeptical. With no potential buyers and property at a premium in Camden I see them separating the properties and selling them off. It's truly a sad day. I was hoping to take a workshop next July with Alison Shaw.